The Bible Translated into Music! After a long period of research, hard work and exciting discoveries, the Music from God project has completed a masterpiece: the Days of Majesty CD. Talented musicians have brought to life music that was encrypted into the Hebrew text of the Bible nearly three thousand years ago - music that has been waiting all this time to be discovered. If you happen to own the first version you were aware of its meditative power - this new creastion emphasises the melodic attributes hidden in the Biblical verses as well as its meditative qualities. 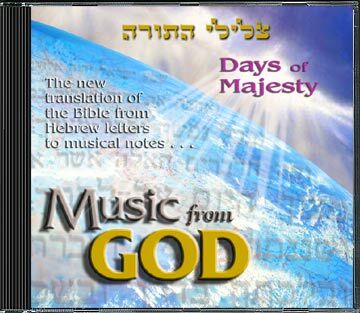 Letters, verses and chapters from the original Hebrew text of the Bible were translated to musical notes to create the music you hear on this CD. Several years of research, hard work and collaboration between many talented people culminated in this beautiful presentation. The CD includes 11 tracks of music that were directly translated from the Hebrew text: 1. Psalm 23 This is one of the most universally beloved of all Psalms. Its haunting, spiritual melody is beautifully expressed by acclaimed violinist J'anna Jacoby. 2-4. Exodus 15:1-3, Exodus 15:4-6, Exodus 15:7-10 These three tracks depict the music in the Hebrew text of the "Song of the Sea." Moses and the children of Israel sang these words after they witnessed God's miracle, and walked to freedom on dry land inside the Sea of Reeds. The music is somber at times, as appropriate to the gravity of the situation. Israel was saved, but at the cost of human lives. The music is not happy, rejoicing over the deaths of the Egyptian soldiers, rather, it is a muted song of praise to God who saved the people of Israel from the hands of their pursuers. The music resembles the powerful water, as it stood upright, and the depth of the sea that covered the horses, the chariots and the army of the Pharoah. The Seven "Days of Majesty" The last seven selections are translated from the text of seven Psalms which tradition says were the daily songs sung by the Levitical choir in the holy Temple in Jerusalem. Each day, the Levite choir stood atop the platform located in the Court of Israel, facing the outer altar, and sang a special song for that particular day. Sunday through Friday: Six days of Praise for the Work of Creation 5. Psalm 24: Sunday, the first day of the week, begins with "The earth is the LORD's, and the fullness thereof." Sunday is the first day of creation; on this day the LORD acquired heaven and earth for Himself, and established sovereignty over His world. 6. Psalm 48: Monday, the second day of the week, begins with "Great is the LORD, and highly to be praised in the city of our God, in the mountain of His holiness." It was on this day that the waters were divided, and a firmament was put in place between the upper and lower waters (Gen. 1:6­7). 7. Psalm 82: Tuesday, the third day of the week, the Levites sang beginning with the words "God stands in the Divine assembly, in the midst of judges shall he judge." On this day of creation the dry land became visible, and on this land, the judges stand to render their decisions. 8. Psalm 94: Wednesday, the fourth day of the week, begins with "O Lord God, to whom vengeance belongs; O God, to whom vengeance belongs, shine forth!" This was the day when the sun, moon and stars were created. Later, men would mistakenly worship these created things and forget the Creator. 9. Psalm 81: Thursday, the fifth day of the week, begins with "Sing aloud to God our strength: make a joyful noise to the God of Jacob." The living creatures were created on this day. To be alive and aware of the wonders of Creation is to be filled with joy and song. 10. Psalm 93: Friday, the sixth day of the week, the Levites sang "The LORD reigns, He is clothed in majesty." Creation was crowned and completed on this day, the last of the original six days of creation. Today man was created, and only he can recognize God's true greatness. Of all the vastness of creation, man alone has the capacity to understand the Creator's rulership, and accept it upon himself to be the king's subject. 11. Psalm 92: For this holy day, the Levites sang, "A psalm, a song for the Sabbath day." Israel's sages taught this Psalm was a song for the future, rectified world "the day which is complete Sabbath tranquility, for everlasting life."